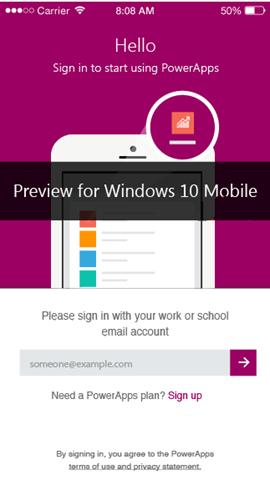 We are excited to announce that PowerApps for Windows 10 Mobile is now available in preview! From your Windows 10 Mobile, you can download the app from the Windows Store or navigate to http://aka.ms/powerappswin from your browser. Let’s take a look at the system requirements and the PowerApps experience on Windows 10 Mobile to help you get started. 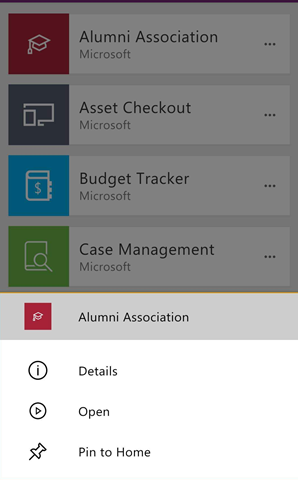 The first time you open PowerApps, you can sign in if you have a valid license or sign up by following the link. After signing in, you will be taken to the list of apps available to you. On top center of the screen, you will find a dropdown menu to switch app categories. Apps have been categorized into four lists to help you quickly find a specific app. All: All apps you have access to, including apps you have authored and apps that others shared with you. My Apps: Apps that you have run at least once. Samples: Sample apps from Microsoft to showcase real application scenarios with fictitious data and to help you explore design possibilities. Favorites: Apps that you've marked by using the "…" option of each app. You can unmark an app to remove it from this list. After you choose a category, you can also sort it by when apps were recently opened or modified. 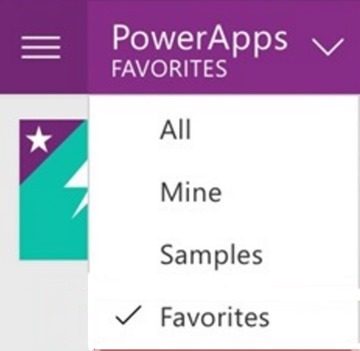 These preferences are retained when you close and reopen PowerApps. Tap on an app’s icon to open an app. Click on the “…”, for options to view the detail of the app or pin this app to the mobile home screen. To exit an app from Windows 10 Mobile, use the back button on your phone to exit. PowerApps for Windows 10 Mobile is in preview and we would love to hear your feedback. For known issues, please see the Common issues list. For any feedback or questions, reach out the community forum. PowerApps er en tjeneste til oprettelse og brug af brugerdefinerede virksomhedsapps, der opretter forbindelse til dine data og fungerer på tværs af nettet og mobil – uden at du skal bruge tid og penge på brugertilpasset softwareudvikling.